Bad Wildungen and Reinhardshausen are proud to have their own large and renowned spa orchestra. Catchy, pleasant music and the natural flair of the spa resorts have gone hand in hand for generations. The orchestra is characterised by the diversity of the music it plays and the varying configuration of its instrumentation. Directed by Russi Radev, the orchestra has an extremely wide-ranging repertoire. Each musician can play a number of instruments expertly thereby making a significant contribution to the relaxing atmosphere of both spa resorts. 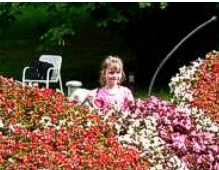 The music played by the spa orchestra in the park and at evening concerts in the pump rooms and its buoyant performances in the band shells or at dances in the Kurhaus, represent a major part of the ambience and relaxation offered by both resorts. Music has been played to spa guests since the very beginning and there was a time when musicians would entertain the guests as while they took the waters. 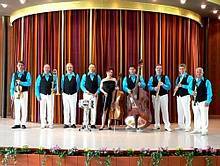 The Bad Wildungen Spa Orchestra is a talented and flexible, multi-national ensemble of ten musicians (6 in the winter months) directed by the experienced Russi Radev. While the orchestra’s extensive repertoire naturally includes ‘classical spa music,’ it also covers traditional café and salon music, waltzes, polkas, operas and operettas as well as more modern numbers. Jazz, swing and Dixieland are the foundations upon which the orchestra’s excellent reputation has been built, although more recent additions have included pop and musical themes, hits ranging from ABBA to the Beatles, James Last’s Happy Music Sound and famous film soundtracks. The stirring evening concerts take various forms and are of a high musical and artistic calibre. The regular dance evenings are especially popular, with the orchestra morphing into a dance combo or a real show band, depending on the occasion. 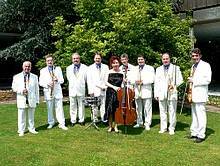 The musicians of the Bad Wildungen Spa Orchestra also make up the Bad Wildungen Big Band which has been entertaining visitors and residents alike at many events since 2006. The ensemble also sets the mood for the monthly information and reception evenings for visitors.